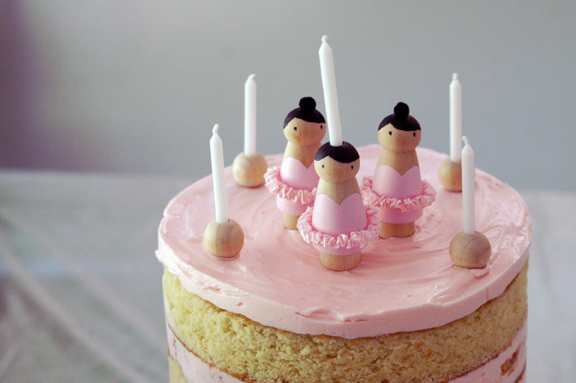 tutorial: pink momofuku birthday cake and lollipop cookies. This is just for those of you who may be interested in reproducing either the cake or the cookies from the Wee One’s most recent birthday party. Neither thing is difficult to figure out – I imagine most of you could sort it out by looking at a few photos – but I thought I’d help just the same: some of you get (unjustifiably) nervous when faced with anything which starts with “M” and ends with “fuku.” So here we go! 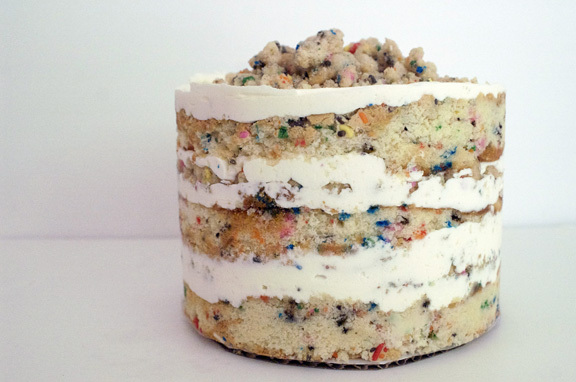 Easy enough: the foundation recipe of this cake is Momofuku’s Birthday Cake (a name which is used interchangeably with “confetti cake” or “funfetti cake”) – all components. If you need the tutorial on how to put this cake together, see the original post: for further guidance, see either my post on the carrot layer cake (the first Momofuku cake I made) or the apple pie layer cake: there’s some really good tips in all three which should help you with the technical aspects. Let’s first look at the differences in the two: the photo at the top of the post is the one I just made for the Wee One’s party; the one directly above is the original birthday layer cake. Note how different they are from one another, but don’t let that fool you: very minor adjustments were made to achieve the birthday cake this year. 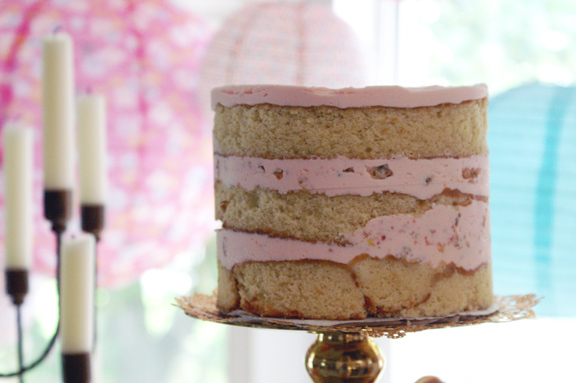 Cake – same recipe, minus the sprinkles. That’s it: it’s amazing how much the sprinkles add to the overall look of the original cake; something I never took note of until they were missing. Sprinkles not only add color, but also dye a little bit of the cake batter around them, like an aura around a star, so their impact is maybe more significant than you think when added to wet cake. Remove the sprinkles, bake according to directions, and be very, very diligent in checking your times. Frosting – Same recipe, wee bit of red dye. Nothing fancy, just the kind you get at the supermarket, which I think works much better, especially for achieving pale colors like this pink. Obviously you can do it any color you choose, but the pink looks particularly nice, in my opinion. I used 4-5 drops to get this color you see before you, added just after you’ve added all the ingredients and mixed for about a minute, and just before you crank up the motor for the final spin. Crumb – same recipe: I wanted a little confetti fun in it, but I wanted it to be subtle: there’s crumb between each of the layers and I added some finishing crumb on top, but I went with a multicolored bar sprinkle minus the dark brown ones: easily found at cake or craft stores, and it makes for a slightly more joyous sprinkle, if you ask me: the ones with the brown mixed in go very nicely with chocolate cakes, however. Alternatively, you could get a monotone sprinkle, or a custom mix, but I recommend sprinkles for a little interest in your finished product. 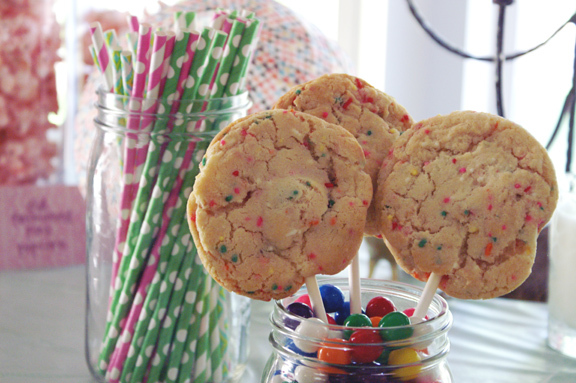 Plus, if you make the confetti cookie pops below, you’ll need a batch of crumb with sprinkles, so why confuse the issue. That’s it: obviously the milk soak and layering technique are the same as in the original post. Moving on to the cookies! Use the smaller crumb – So, when you make the confetti crumb, there will be large crumbs, medium crumbs, and small crumbs. You’ll come by this organically: it’s just the way the crumb tends to come together, in a pretty equal distribution. When making the crumb to use in the cookies, try to break up the crumbs into smaller-size ones, because you won’t have any large crumbs making things difficult for your cookie sticks later on. Better to crush them up now than to worry about it once inside the batter, believe me. 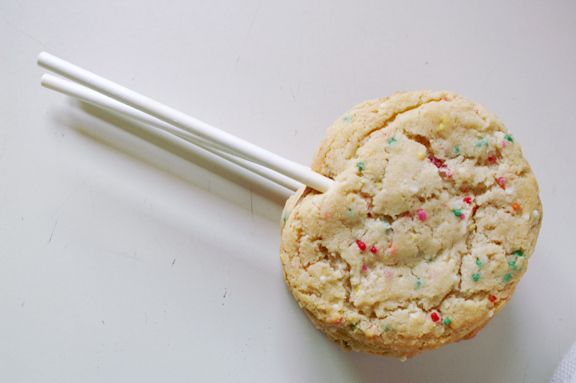 Use a 2-ounce ice cream scoop – This seems to be the optimal size for cookies on sticks. Smaller, they look funny. Larger, their weight becomes an issue and leads to increased breakage. This size makes them exactly like the whirled-together hard candy lollies you see in stores: visually pleasing, and with a good amount of stability, which means you won’t have cookies leaping to their death during your party. Really press those cookies into that ice cream scoop while you’re making them, also: this makes them hold together much better, so don’t get lazy about it. Aim correctly – You insert the sticks before you bake, not after – someone thought I did it after because they said they saw a tutorial about something similar, and the idea of that has perplexed me ever since. How would one insert sticks into fragile, just-out-of-the-oven cookies, when cookies are at their most vulnerable? I don’t get it. So the sticks go in before you bake them. Insert them in the dead center of each ball: when you lay the cookie onto the baking sheet, the stick should (obviously) be lifted up because it’s coming out the center. Because why? Anyone? Anyone? Spread, that’s why. When the cookies bake, your stick will scoot down as the cookie spreads out, giving it perfect placement. Hawk-eye those cookies – You didn’t go through all this trouble to watch these cookies fall apart one by one, correct? So don’t bake them like you would a softy-soft chocolate chip cookie: you’re looking for a cookie which will stand at attention and not goo out all over the place. Don’t overbake them, but make sure they hit the point where they are baked through and through, which means follow my baking instructions on the original confetti cookies post, and start checking them (obsessively, like it’s your job) at the 10-minute mark. As a guideline, mine came out at around the 13-minute mark, but everyone’s baking sheets and ovens are different so don’t be lazy and use my timing. Cool out! – Seriously, leave them on the sheet. No, more time on the sheet than that. I know you’re in a hurry because I really only want you to bake these 4, maybe 5, at a time, but just hold your horses and let them sit for a little while until they’ve firmed up completely and are stable. Once they’re ready, use a solid plastic pancake flipper (DO IT), slide it under each cookie, and transfer them gently to a cooling rack to cool completely. Consider the weather – I realize that sounds ridiculous, but not kidding: some of us live in humid climates, and some of us do not. I don’t know under what weather pattern you’re making these, but humidity is indeed a factor; not so much with cookie pop success, but rather with display efforts. You saw on the photos that I had filled a Mason jar with gumballs (standard practice for parties, and it makes for a cute and cheap display) and stood a few cookie pops in there. Those were the only cookie pops standing vertical, however, because it was 108 degrees on party day with a humidity level floating somewhere around 583%. 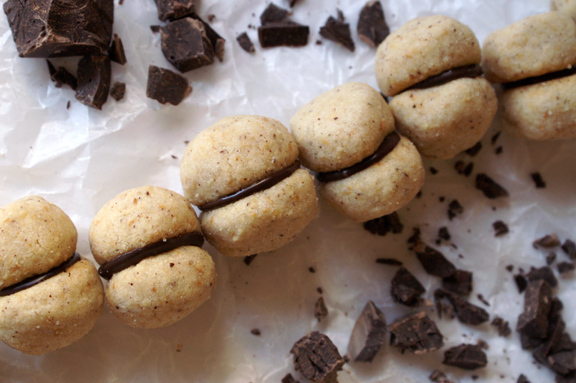 To snickerdoodle cookies – which are always softer, due to composition and science – this means cookie pop suicide (To the corn cookies, this is not an issue.) I displayed the rest fanned out on a platter and it was adorable: consider doing the same if it’s particularly hot or humid, or both. If it’s not, and you followed all the steps correctly, you shouldn’t have to worry about it. There you have it! As always with these tutorials, I welcome follow-up questions. If you try this and get stuck on something, ever, I don’t mind an email! Or comment: I see those too, and am happy to help you through any issues which pop up mid-recipe. Broken record time: I suggest reading through this tutorial (and the ones I’ve linked too) first before attempting any of these: I know you’re not preparing to jump your motorcycle over 72 cars, but I do know that Momofuku recipes are some of the most step-filled, intense recipes to make, so knowledge is everything here. Most of all, though, have fun with these! I chose this cake and these cookies because I thought they would be perfect: I also chose them because for me, they’ve become the most easy cake type and cookie type to make, and I can do it in my sleep. That may sound crazy, but I’m not kidding: It’s like I say to the Wee One…you can do anything – even if it’s really hard – but you have to practice. Okay, so that’s not entirely true: no matter how hard I tried, I was always a big failure at snowboarding. As nature intended, most likely. But everything else…practice. 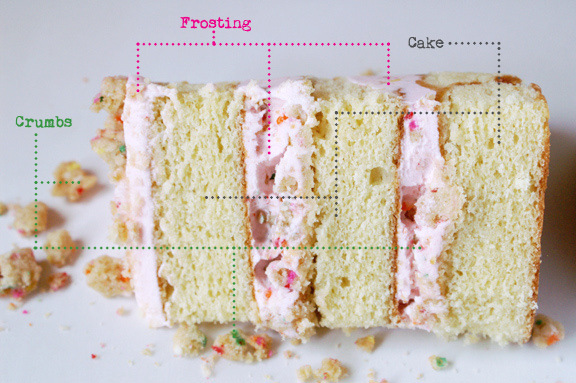 My slightly altered (especially for bake times) Momofuku Birthday Layer Cake recipe found here. The recipes include the crumb, cake, frosting, and milk soak, and also how to put it all together. Ditto on the Confetti Cookies, recipe here. i know, right? maybe on YOUR birthday, Matt. all raisins EVERYTHING. The cake and cookies are a spectacular birthday dessert! 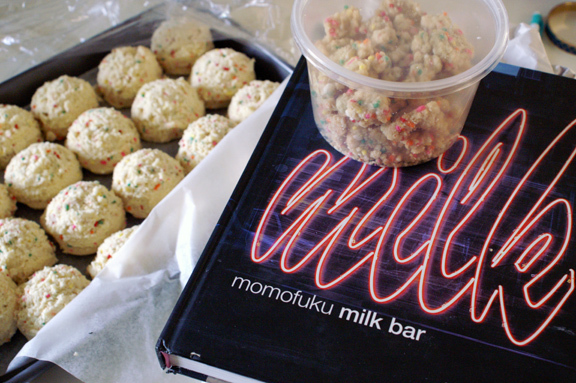 I have yet to try one-single-recipe from my Momofuku cookbook….sigh. When you post one of these wonderful recipes I pull my book down, make plans and then just don’t follow through. One day I will though! Thanks, Deb! the Wee One got a big kick out of them, for sure, as did her guests: seems as those everyone loves a sprinkle-filled treat. 🙂 Crack that book open! There’s a few cakes in there which are absolutely perfect for the season right now…apple pie layer cake, you could do the banana cake (which always looks delicious)…so many choices. Hard to sometimes dig in, though: it’s a time (and ingredient) commitment, definitely. I’m actually toying with making 2 of the cakes myself, but i haven’t started. Between this and the “Sweet Spot” episode of the first season of Mind of a Chef, I really think that getting the Milk cookbook is an eventuality at this point–maybe around Christmas–because you make these recipes not only accessible but I know I have a resource to bug if something isn’t working. 🙂 Gorgeous, as always! You should! How about this: you get Milk Bar and i’ll get (what i call) “Regular Momofuku” and we’ll act like it’s a book exchange – even though we keep our copies. 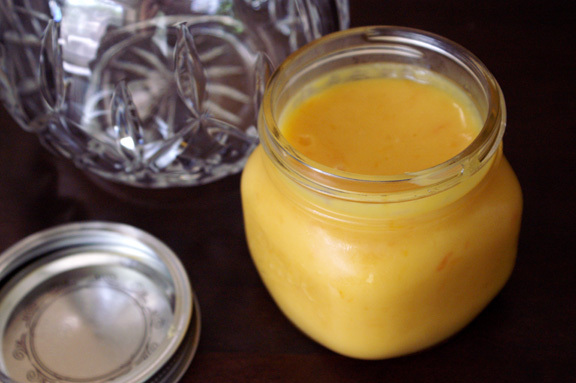 I’ve only rented the Momofuku cookbook (albeit numerous times, enough to basically own it), but have only made really small things from it, and nothing ever got posted to the blog when i did. Let’s do this, because you always make the regular recipes seem so much less complex (and so dang doable!) when you make them. What a nice tutorial, and very handy for a cake like this! 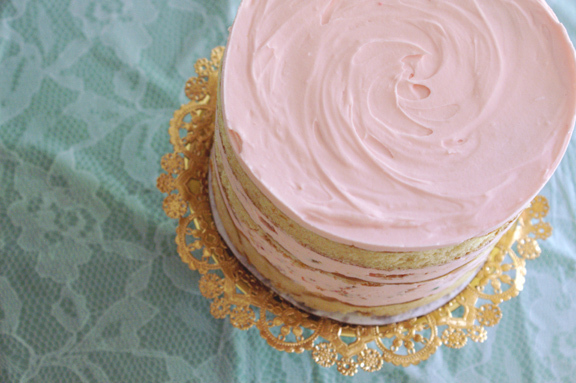 I just adore that gorgeous pale pink color on the icing. The cake looks nice and moist, and the crumbs have got to be such a hit. 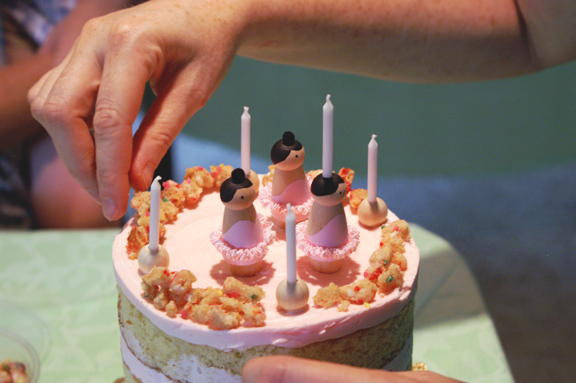 And also…I can’t stop looking at that beautiful gold doily, or skirt, you place under the cake round. It’s such a nice touch and looks gorgeous! Thanks, Monica! That’s my Wee One: she loves a pale pink. I believe i was instructed by her to get it “as close to her ballet outfit as possible,” and i think i achieved that. 🙂 Doilies are one of my “old person” things – i love them, and always pick them up in all sizes if i wander past them. 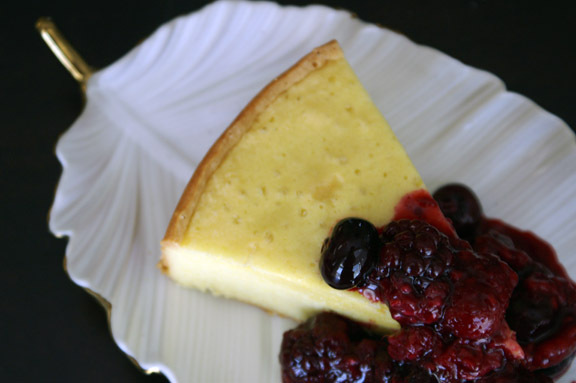 they make a great design on confectioners’ sugar-dusted cakes, so they’re hard to pass up. The cake and cookies are AMAZING and you already know that your momfuku tutorials have held my hand MANY times and helped me tackle what seemed to be impossible. I love these SO MUCH. I need to find a small child to make these for. Or, you know, just an excuse to make them. you know what’s a good stand-in for a small child? Lots of adults at work. Present them with this cake/cookie combo and i bet they actually begin to act like a gang of 4-year olds. I love Momofuku’s recipes. But you are right. They do take some practice. Perhaps not as much as snowboarding though. just go back to skis! Your blog is beautiful! I love the momofuku cake. I have never seen anything like it, and as a wordsmith, I love to cook/bake things that are also fun to say! I actually stopped by to invite you to come and join the Missouri Women Bloggers network. It is free to join. Our goal is to gather, grow, and connect MO bloggers to empower all of us. In the coming months we will be offering our members meetups, a conference, and compensated writing and blogging opportunities. Just Google Missouri Women Bloggers to find our website where you can learn more about us and join in. Hi Fawn! Thank you so much for your kind words. I will definitely stop by and check it out. Thank you!